Preview: It’s obviously a rebuild for the Pirates this season, but ECU has been in this position before only to surprise and get back to a bowl game. You can never count the Pirates out, but it’s going to be tough to replace the offensive losses of OC Lincoln Riley, QB Shane Carden, and WR Justin Hardy. Last year ECU fell short of their very lofty expectations as they finished the regular season 8-4 overall followed by a 20-28 bowl loss to the Florida Gators. East Carolina has become well known for their pass attack in recent years and the Pirates are hoping to continue with new QB Kurt Benkert under center. 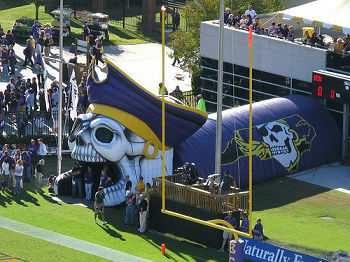 ECU will continue their air attack under new OC Dave Nichol. Even without standout WR Hardy moving on there’s still a lot of talent left at receiver with guys like Jones, Brown, Williams, and Grayson. The O-line looks to be in great shape and this unit should be able to continue to open shape for tailback Chris Hairston. ECU was surprisingly stout last season on defense ranking very well at stopping the run and getting off the field on third down. The Pirates weren’t the biggest team up front and as a result they did have some issues against the tougher teams on their schedule. The D-line is in rebuild mode with DE White being the only returner, but the unit is hoping to get a boost from returning injured player Terrell Stanley. LB is a position of strength with guys like Bigger and Overton headlining the group. The secondary has experience with guys like Hawkins, Simmons, and Scarfone in the fold. Prediction: This team isn’t expected to be full throttle right out of the gate and it could take some time to acclimate new pieces on the offensive side of the ball. Expect some regression given the loss of all-time program performers Carden and Hardy moving on. ECU has a tough nonconference slate again this year, but this group should still be in the mix for a bowl game.